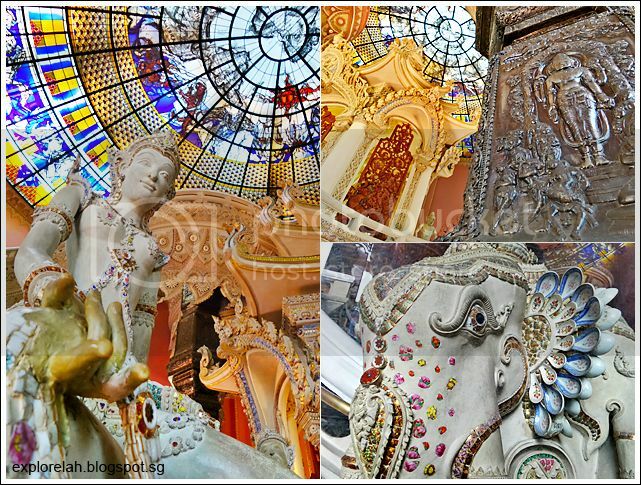 It is not unusual for people to pick their eyeballs up from the floor after visiting Erawan Museum. 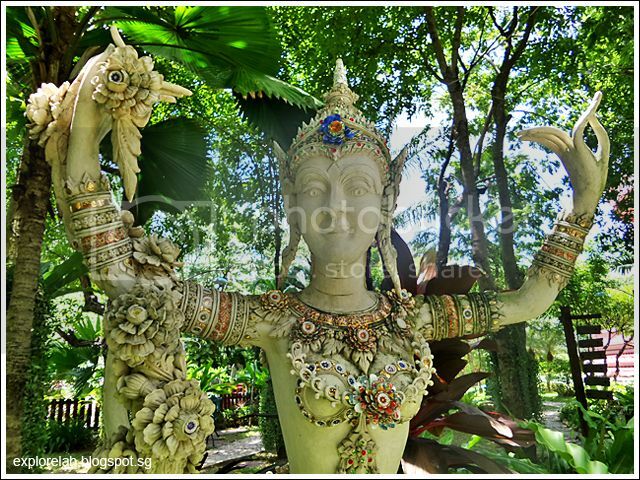 The Bangkokian attraction has many eye-popping features that stretches not only the imagination, but one's ability to hold on to the jaw as well. Lest there be one more thing to pick off the ground. An incredible manifestation of one man's ambition to preserve fragments of Thailand's cultural footprints and religious heritage, the museum is many things all at once - an unofficial shrine of Airavata, a depository for precious Buddhist artefacts, a celebration of religious plurality, a showroom of Thai ceramics and a dizzying canvas of artistic interior decorative styles. In my opinion, calling it a "museum" is a somewhat inadequate description of the sensory buffet that this lesser known attraction in Bangkok presents. Almost a decade (1994 - 2003) in construction, Erawan Museum is an architectural feat conceived by Thai business tycoon Lek Viriyaphant (also referred to as Khun Lek) who found his wealth importing luxury cars before succeeding in the banking sector. 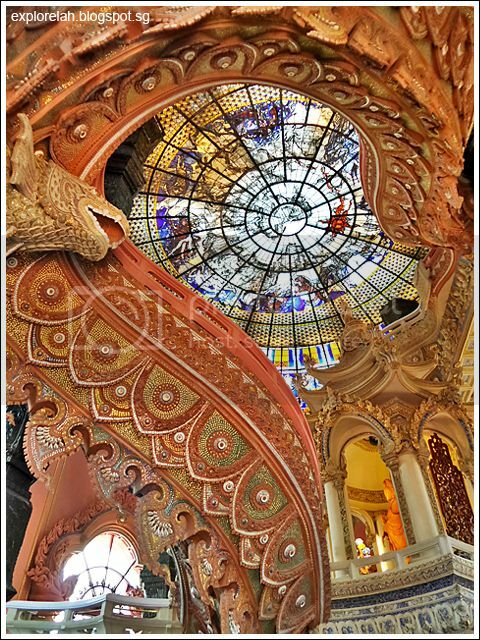 Erawan Museum was constructed to house his vast collection of Thai antiques (consisting mostly of benjarong, the Thai version of multi-coloured porcelain wares) and religious artefacts from various time periods in the Kingdom. Erawan Museum is one of 3 historical theme parks realised by Khun Lek to serve as walk-in cultural textbooks for Thais and visitors alike. 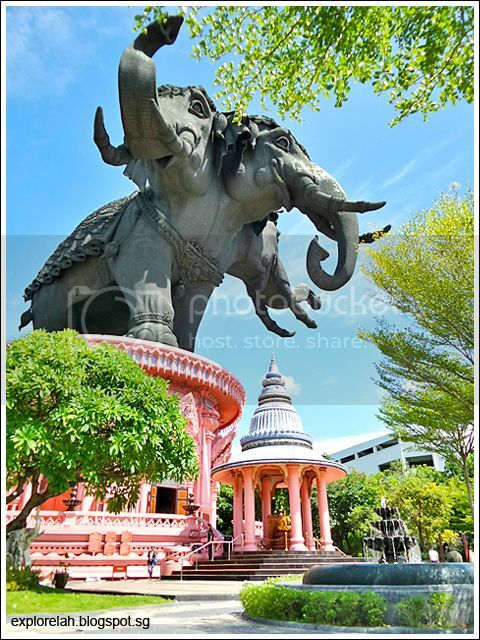 The other 2 parks are the sprawling Muang Boran (Ancient City) which consists of a massive collection of scaled-down architectural gems found throughout Thailand and the Sanctuary of Truth in Pattaya. 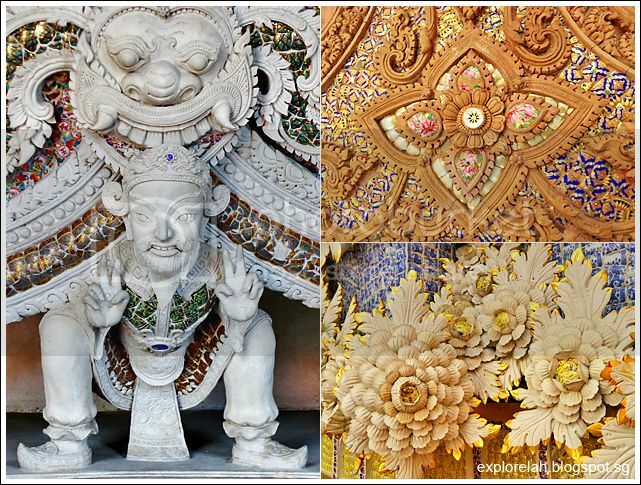 I visited Muang Boran a couple of years back and it is not too far from Erawan Museum so you may want to consider visiting both Bangkokian attractions as a day-trip. 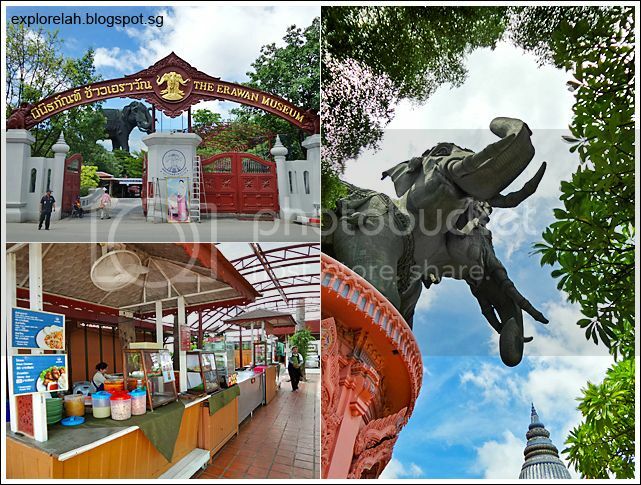 Located within the Samut Prakan Province (home to Suvarnabhumi Airport), Erawan Museum is not to be mistaken with the popular Erawan Shrine near Grand Hyatt in downtown Bangkok. The park grounds are well-maintained with clean facilities and F&B options are available. 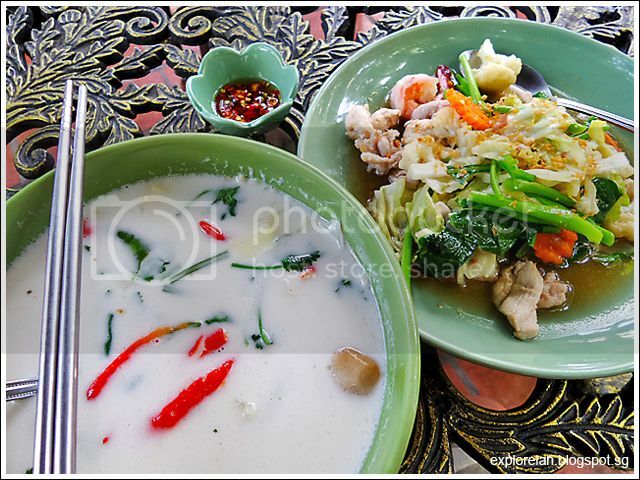 I decided fill up on lunch before starting my exploration with a soup of chicken, galanga root and coconut milk (80bht) and stir-fried greens with prawns (60bht). Stayed hydrated in the hot weather with a fresh coconut (40bht). 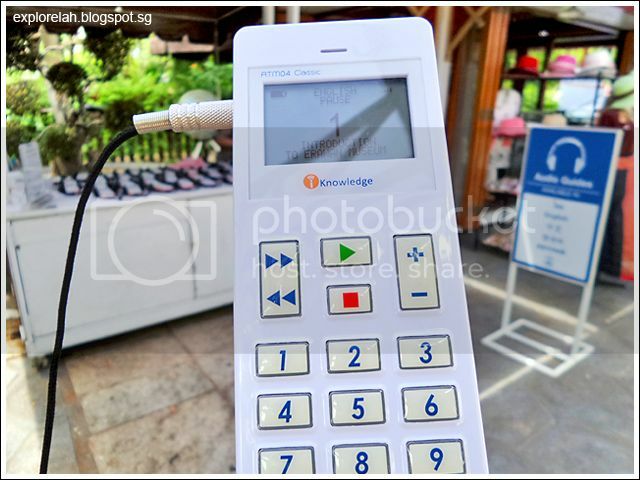 The entrance fee of 400bht (adult) includes rental of an audio guide that comes in 3 languages (Thai, English and Chinese). A refundable deposit of 1,000bht is required. The audio guide introduces the Erawan Museum through 14 narrative clips that covers an introduction to the conceptualisation and construction of the museum to the philosophy and stories behind each level of the museum. 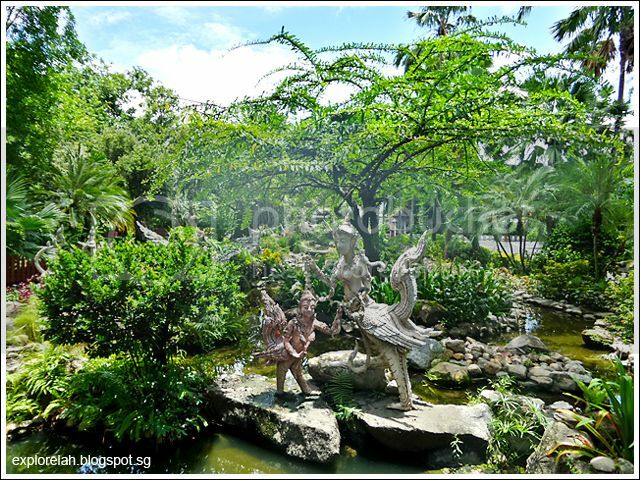 Surrounding the museum is the enchanting Mythical Garden with a collection of celestial figurines and creatures. So don't miss checking out the garden after visiting the museum. Sculpture of a dancing aspara at the Mythical Garden. 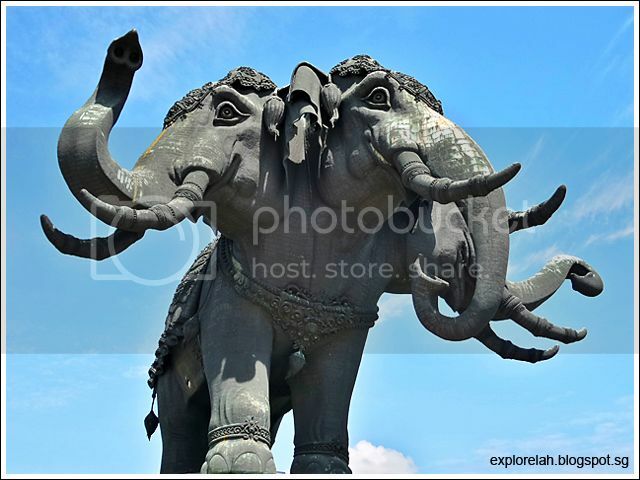 An imposing figure that no vehicles passing the Bang Phli-Suk Sawat expressway will miss is the iconic 3-headed elephant of Erawan Museum. The total height of the building and elephant measures 43.6m, or roughly 14 storeys high. In front of where the middle elephant head is facing is a stairway leading to a vantage point for an unobstructed photo of the entire building. As the stairway is rather obscured against the wall running the perimeter of the park, remember to keep a look out and you can take a shot like this photo. The best time to take a photo of the building is around 3pm as that's when the sun lights up the faces of the elephant. I arrived at around 12pm and took a shot but the sunlight was directly above the elephant, casting a shadow that made the facial features indiscernible. The elephant stands at a height of 29m with the length of its body measuring 39m. 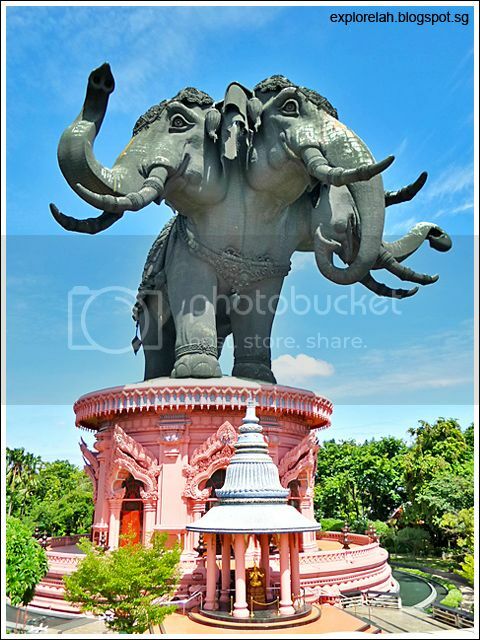 This massive beast weighs 250 tons and is the largest copper statue in Thailand and quite possibly the world. 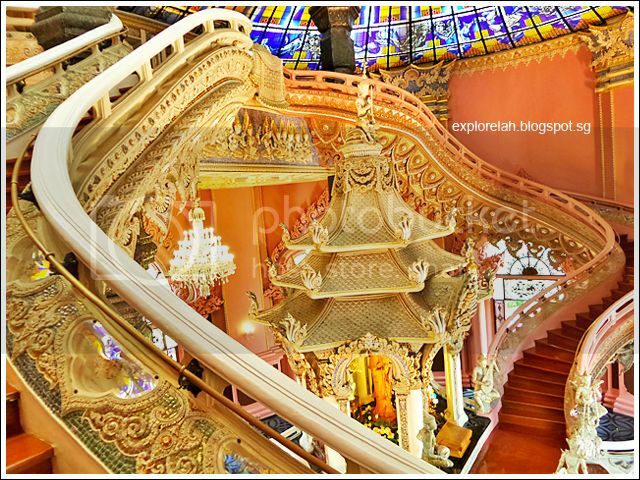 Erawan Museum consists of 3 sections, each representing a realm of existence according to Buddhism. Visiting the museum follows a specific sequence starting from the lower realm (underworld) to the middle section (the human realm) and finally to the top level (celestial realm). 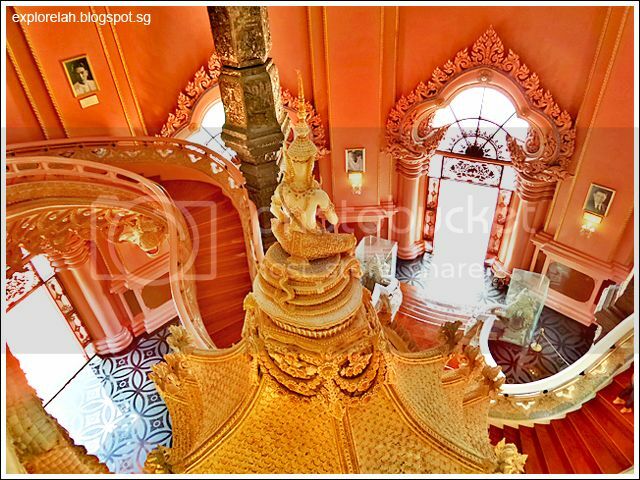 An allusion to the underworld or hell, the lower realm actually houses Khun Lek's massive personal collection of cultural artefacts which are dominated by Thai ceramics (benjarong) and pottery. 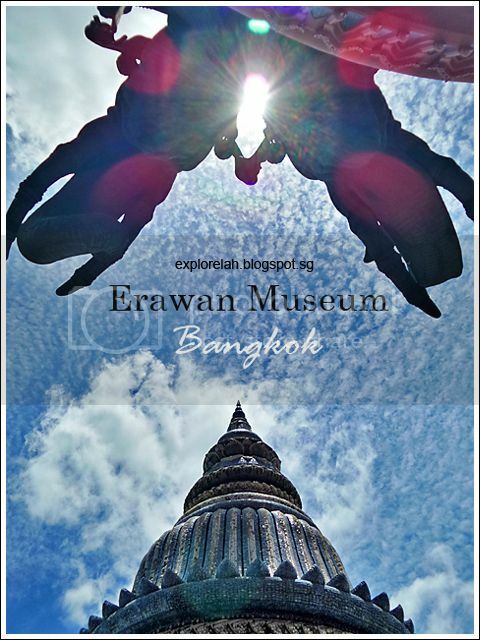 This section of the museum also provides an insight into the life and times of its founder so it is a good place to start appreciating the history of Erawan Museum. This is the most 'museum' part of the whole experience. It is very tempting to head straight for the middle section but pass through this door to the left of the shrine and the story of Erawan Museum is unfolded. The first narrative clip on the audio guide starts here. 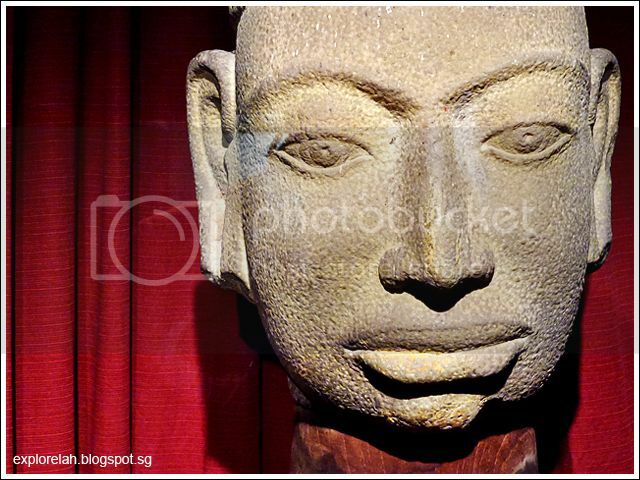 Head bust of a religious figure. Photography is not allowed in the lower realm so I only sniped 2 shots without flash for memory. The ban on photography stems from the fear that flash photography may bleach the ceramics of their colours. I shot without flash. 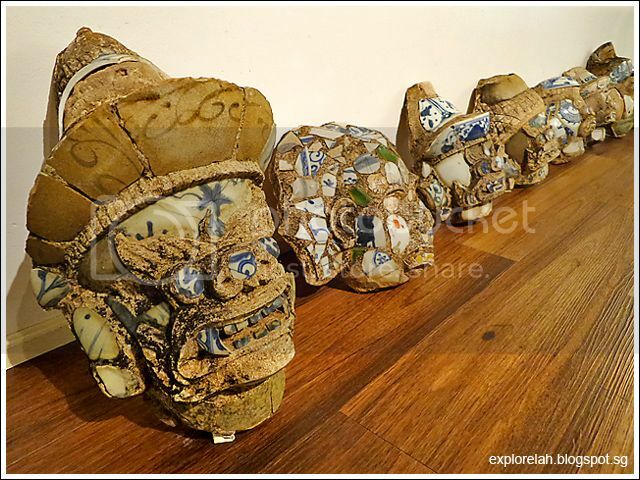 A line up of Yaksha and Yakshi (male and female guardian spirits) faces composed by porcelain shards and clay. Emerging from the lower realm, I 'moved up' to the middle realm on the ground level where a stunning jigsaw of decorative styles with handiwork so intricate beckoned. 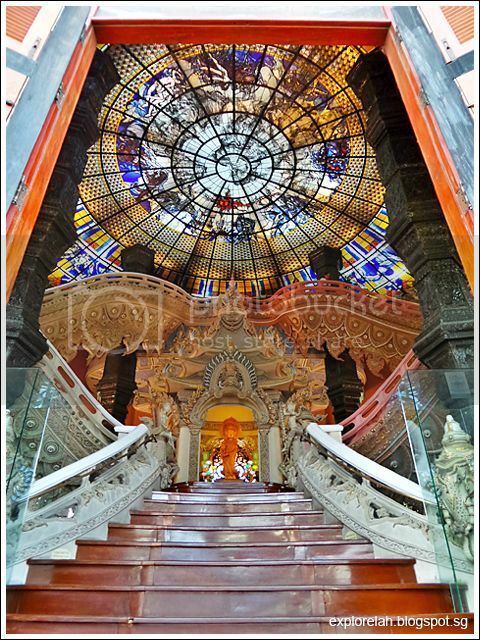 This main section of Erawan Museum pays tribute to the sacred intentions of religions to create a better world and serves to remind that religious harmony is the pillar of peace amongst nations. 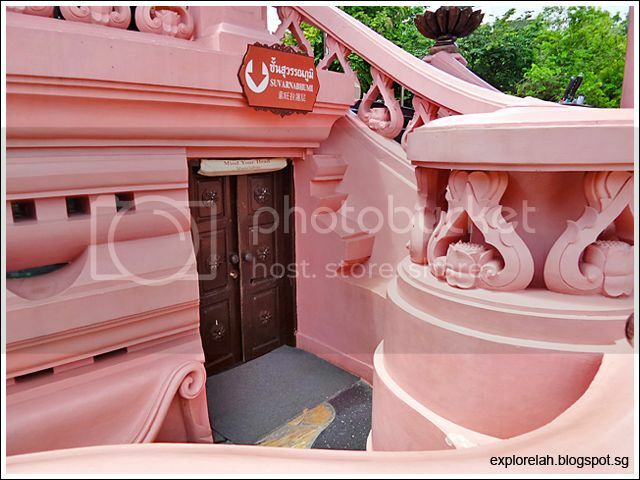 The pink walls used in its build is made from pounded lime stained with the colour of chewed betel nuts. The builders must have very chiselled jawlines and sore gums! 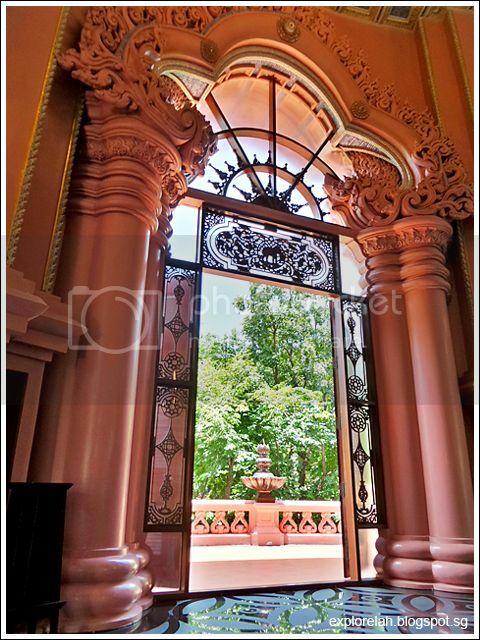 One of the doorways leading to the artistry within. No shoes allowed in this section and visitors are required to dress modestly (no singlets, shorts and revealing clothes). To take this shot with my mobile phone, I was practically lying on my back to fit as much elements in as possible! Selfie to record myself in this gorgeous interior. 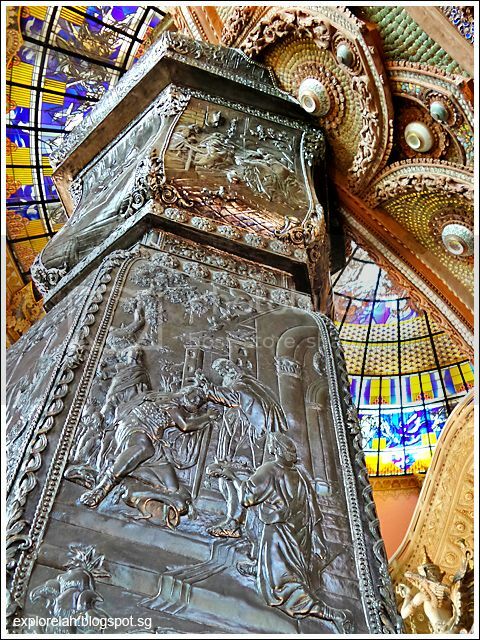 There are 4 structural pillars covered with metal embossing that depicted scenes from Hinduism, Buddhism (Theravada and Mahayana) and Christianity. This is the Christian pillar showing a scene of baptism. Harmony amongst religions in guiding the human existence is the theme here. 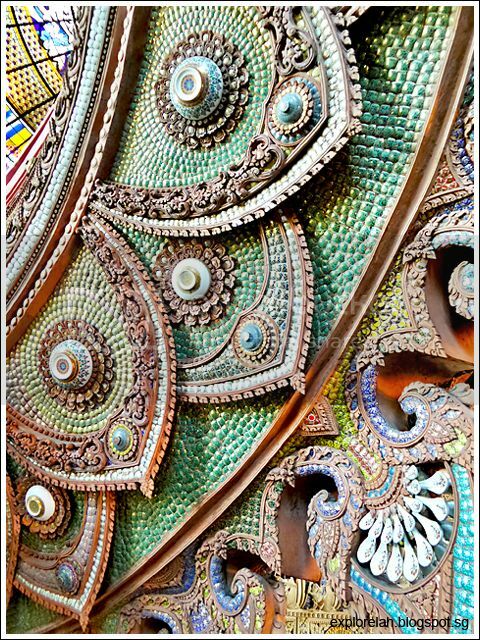 I think more than the visual beauty of the decorative styles, the touching beauty is the message of diversity and acceptance. Erawan Museum is really photogenic. Love it! A closer look reveals what the colourful skin of the interior is made of... spoons, bowls, dishes and porcelain bits! A pavilion altar of sorts houses a statue of Guanyin. 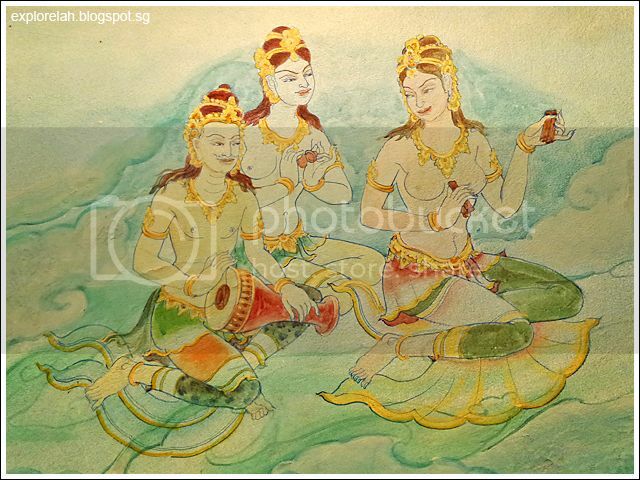 The deity is the central figure here because of his compassionate link to humanity. Close-ups of the patterns and design. The Chinese deity with his hands up in peace signs had me keeling over with laughter. See if you can spot him amongst the cacophony of decorations. 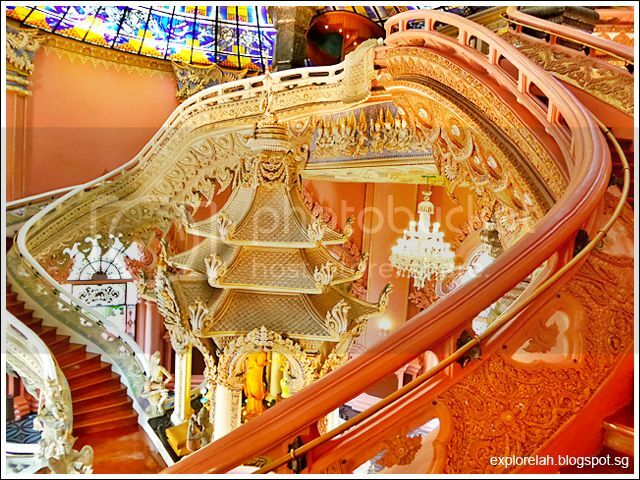 The belly of Erawan Museum's main hall is filled by 2 snaking staircases... one white, representing the silver way to nirvana, and one pink (representing the golden way). They are known as The Ladder to Heaven. Glad to know there's more than one way to get to eternal paradise! View of the interior from the top of the stairs. 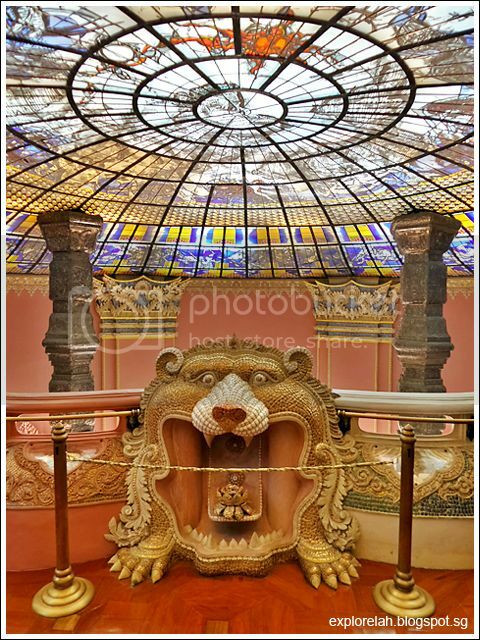 A Baroque-ish lion head (singha) with a lotus tongue is found in the middle at the top of the stairs. 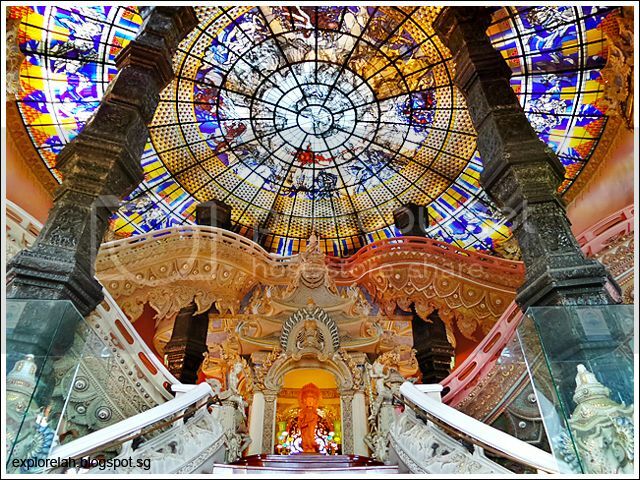 At this height, you can have a closer examination of the dazzling stained glass ceiling designed in Germany. The journey continues upwards to the third section of Erawan Museum that tops off as the celestial dimension (representing the cosmos / enlightenment / paradise). There are 2 ways to get up - by a spiral staircase or the lift. Taking the stairs is a scenic option as a swirl of asparas accompany the ascend. Its not a very long time and works to build up the anticipation of what's at the end of the spiral tunnel. If the climb up the stairs didn't make you pant, the painted asparas might. ... nirvana! Or closer to it. The upper realm is housed within the belly of the elephant sculpture and has a line up of ancient Buddha statues from different periods leading to a central altar with an imprint of Buddha's foot in front of it. Photography of the ancient statues along the perimeter is not allowed. Honestly, the celestial realm caught me by surprise. 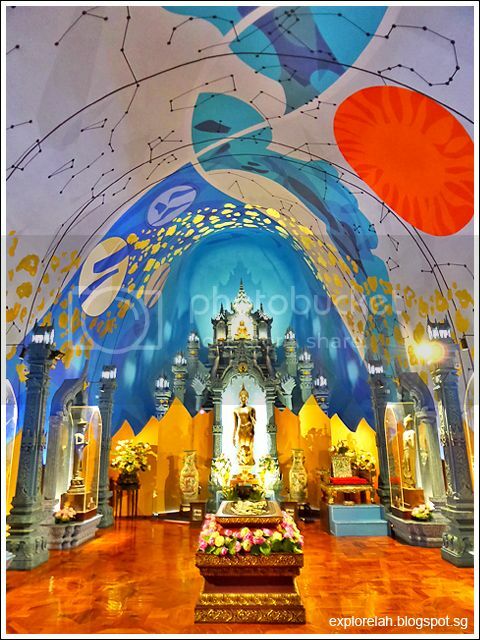 I expected it to be a traditional Thai shrine filled with countless gold figurines of Buddhas and monks while coloured tiles and cut mirrors provided the decoration like most Thai wats. I wasn't prepared for this meeting of abstract art and religious relics. 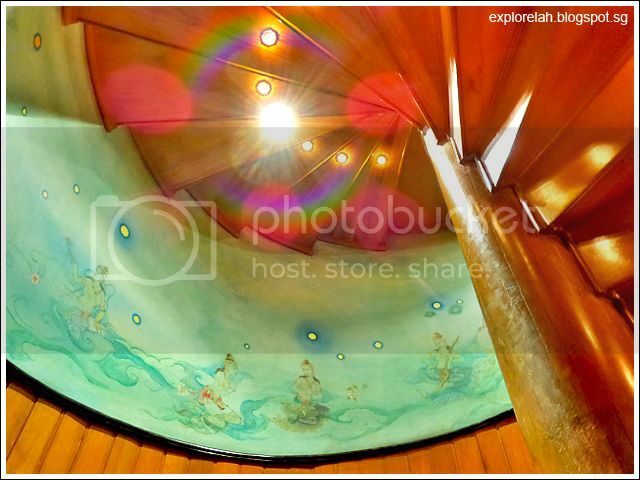 The ceiling features a artistic interpretation of the cosmos with a band of comets, planets, milky way, the sun, moon and zodiac constellations. That forms a backdrop that the Buddha statues, hundreds of years old contrasted from. I thought the unlikely combination was bold and refreshing. It felt more like an art installation but devotees do come here to pray and even meditate like it is a functioning shrine so keep a code of silence and be respectful when visiting. 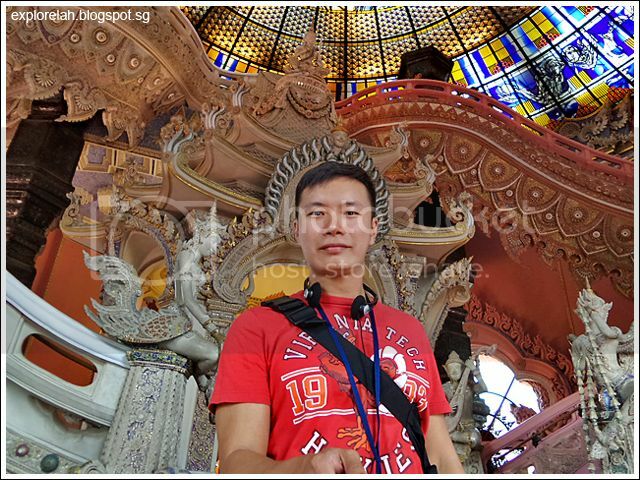 Having had my senses elevated through 3 different realms with their distinct decorative styles and purposes, I felt an appreciation of Erawan Museum that went beyond just the visual, but spiritual even though I am Christian. 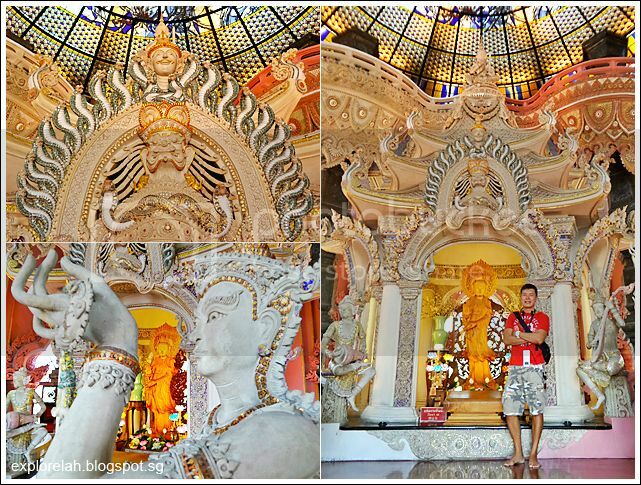 When it comes to off-the-beaten-track tourist gems in Bangkok, Erawan Museum has got to be the mothership! Getting There : Take the BTS to Bearing Station and take a taxi there for under 100bht (15 minutes). I took a taxi directly from Silom Road to Erawan Museum and it took me about 40 minutes (without traffic jam) and cost 237bht. Including 3 toll charges of 50bht, 20bht and 30bht, my total fare was 337bht. However, on the return trip, my taxi fare was only 133bht. As the museum is quite out of the way, few cabs wait at its entrance for passengers. You can ask the security guard to point you in the direction of a main road (which is a short walk opposite the museum's entrance) where the chances of getting a taxi is higher.